PIEK! joined the ‘Sandberg zoveel’ exhibition. 10 years Sandberg Instituut, a summary exhibition in Arti et Amicitiae, Amsterdam. Kunst en Aars is an installation, first shown in the exhibition ’10 years Sandberg’ in Arti Et Amicitae. The installation is a photograph (100x 68cm) and a video (1.58 min). 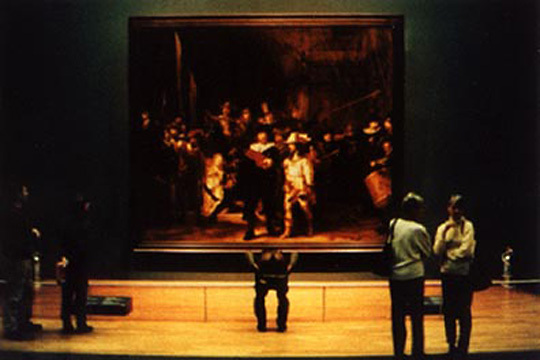 The photo shows the artist mooning, the dutch cultural icon The Night Watch by Rembrandt. The video shows the artist and the photographer while making the photo. In the soundtrack of the video a woman talks about The Night Watch, this is taken from the museum audiotour. Photography by Daan Brand, camera by Dimitri Germain and the audiotour rip by Eva Knutz. NB:PIEK! was kicked out Het Rijksmuseum and is never allowed to set a foot in the museum again.